I’ve put together a package that contains 2 SYD T-Shirts, a 12 oz trio pack of SYD rub and 2 bottles of SYD BBQ Sauce. The Rubs can be used as a rib, pork and a brisket rub. Sprinkle it on seafood or salads. Use it with potatoes or even spice up your popcorn. The Chicken Rub is the competition rub I used to win 1st Place for 2012 in the chicken category by the Kansas City Barbecue Society. 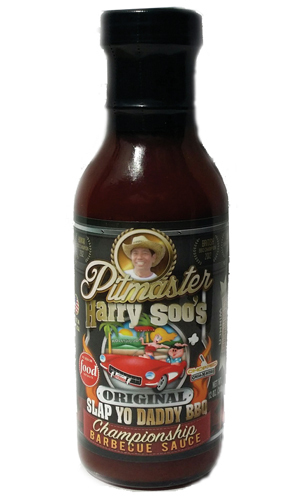 Elevate your BBQ with Slap Yo’ Daddy’s original flavor competition barbecue sauce. Original flavor is Kansas City sweet with a California spicy kick. Finish your barbecued meats (like chicken, pulled pork, ribs, beef or lamb) and vegetables with this tangy blend of spices. Its rich deep color and shiny, smooth texture will make your barbecue look just like the pros on TV. Slap Yo’ Daddy barbecue sauce works as a marinade, a dipping sauce or a finishing sauce. Steaks, hot dogs, hamburgers, sausages, salmon, beans, and corn taste better with Slap Yo’ Daddy sauce. check out SlapYoDaddyBBQ.com for more recipe ideas. love tocook bbq and love to watch u guys on tv. Crossing fingers and toes to win! I personally want to thank Harry Soo for what he did for me. I entered his personal entry for sauces and rubs, and I won it! My wife and I both love the products and use them all the time on a lot of stuff. Anyway Harry, thanks for doing this as we common folk just love to win a free prize of such usefulness and quality! We love the products!!! I think Harry deserves a hand!! Salute!! Great guy! My son could use a Slap Yo’ Daddy birthday treat! My husband a ould use your rubs and sauces. He love to cook outdoors. If it is too cold to cook outside . He uses the oven in the house. He loves to try new recipes.